I must admit that I didn't make any pasta this week...well one with just some jarred pasta sauce to feed two little boys, so in my world that doesn't count. But I've lost five pounds in just a couple of weeks with only minimal slipping off the South Beach Diet wagon. of Very Culinary did a wonderful job. Her little intros are almost as delicious as each dish. I can't wait to give each on a try. Thanks Amy for such a great job - any time you want to do it again let me know. As for the rest of you terrific PPNers....merci, gracias and ....well ....thank you in every language! I can't believe that summer is done...okay perhaps not officially, but next week it's SEPTEMBER! Where did the Summer go? 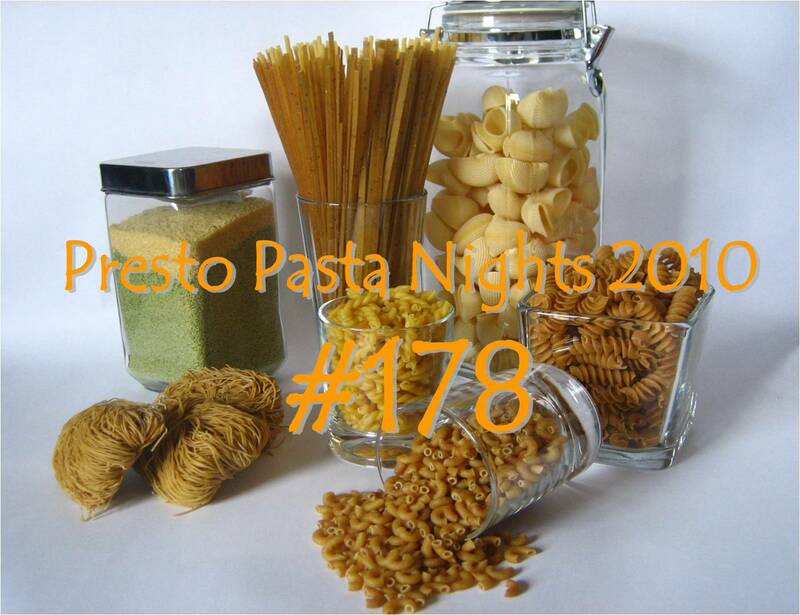 I'll be hosting PPN for the week, so send your entries to me ruth (at) 4everykitchen (dot) com. Will you be making one more Summer treat or already planning something Fallish? Last 2 weeks in September are in need of hosts. Please let me know if you want to have some fun and take over the reins. October and beyond are wide open too.